I was actually planning of allotting this whole month of May for this year, but since my time was enough and my enthusiasm in writing unusually pumped me to produce the best picture profiles of all the nominees in a short period of time, after less than a week of journeying this year, here are the results. # 9 to # 6 is really confusing, and any of the four might go ahead of the other if I had posted the results on a different day. They are entirely diverse films, and I hope I will be able to revisit them to give them another chance (Maybe, they will end up having a rating of 5 as well! Who could say?). # 5 is actually more of a 4.5, but I give it that rating because between 4 and 5, that film leans towards the latter. # 4 also sits comfortably in that position. The top 3 were so hard to rank because seriously, any of the three could have been my choices and I will be pleased. With those three, I used the denominator of what film stayed with me the most. Of course, all of them did, but more on the severity of the staying power. And with that, I give you THE VERDICT! 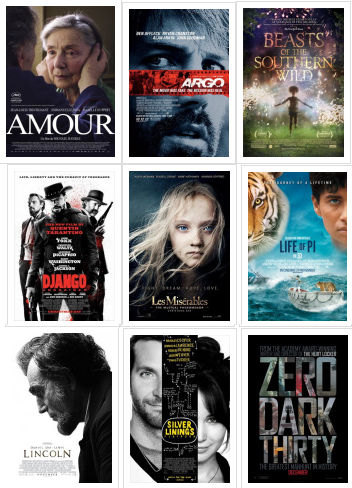 This film strongly starts this group of nominees. The execution is flawless, the performances are terrific, and the whole environment feels very authentic. That is really admirable for a period film. I cannot imagine the amount of work put into every bit of detail, and the final product shows it. Shockingly realistic performances fulfil the film’s heartbreaking but surprisingly distant observation of a couple’s agony in trying to survive amidst the challenges in their relationship caused by the woman’s illness. Its bone-deep examination of the characters is haunting and unforgettable. Explosively entertaining though somewhat uneven, the film is held up by the strong cast who supply flawless work in this entirely amusing Western saga from its ever exciting director. 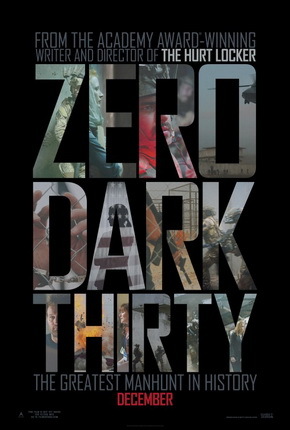 It is a brutal but undeniably engaging to watch and the material definitely top caliber. Watch out for the amount of blood – ‘explosive’ really defines that! The more I think about the film, the more I realize how good it is. There are actually few flaws in terms of the actual execution, just lots of ‘could-have-been-better’ moments, especially in the film’s final act. Still, the film is extremely effective in conveying the ever-lingering sense of threat that makes the experience more gripping. The priority given to the question whether God exists is the same as to the answer given by showing the spectacle of everything that happened to the lead character. The visuals are breathtaking, and what goes with that is a really cathartic experience for the eyes, for the heart, and ultimately, for the soul. This is an intelligent romantic-comedy that is not afraid to go darker at times. The handling of the mental illness in the story is sensitive, and the development of the romance is absorbing to watch. And to see Bradley Cooper and Jennifer Lawrence do a duet of acting flair is just as mesmerizing as their onscreen romance. Unlike any other film this year or in any other year, here is a vibrant and completely original story of a child’s viewpoint as she faces the entire magnificence of the universe. Told with an energetic eagerness and urgency, this film has its own pulse and its own soul: this is a lively tribute to childhood and to life. If I am complaining the lack of courage in Argo, then this film takes every bit of risk along the way, giving a dauntingly immediate chronicling of a woman’s efforts to capture an icon of terrorism. The relevance to today’s society is present, making the film a more captivating one. The last thirty minutes of the film are sheer breathtaking filmmaking. 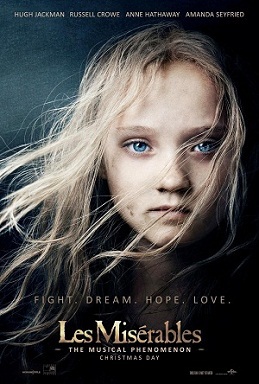 Victorious in every single way in utilizing every cinematic component to bring to life this classic epic, Les Miserables totally brings every possible fragment of human emotion to the screen to create a certainty of mastery not only in the knowledge of the craft and the artistry of making films, but the deep understanding of the material and of its soul. This film will endure the test of time, I tell you. I admit I was a bit too enthusiastic these past days that I was able to finish this year in less than a week, considering that this year have nine nominees! I am happy with my choice, and though not all of them earned 5 Meryls, all are strong films that could have all been worthy choices. 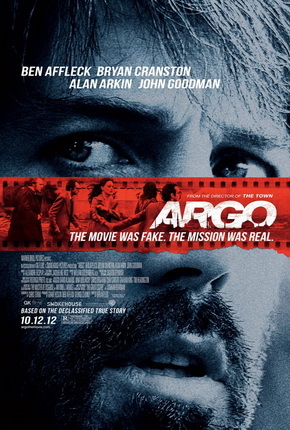 The Academy went with the surprisingly conventional Argo, but it is a really finely made thriller. And for a short tribute to my choice for this year, here is a terrific video from Youtube, “One Man Les Miserables” by Nick Pitera. Such an amazing video! Next year to be discussed will be announced next week. I hope that I will be able to slow down a bit (mygosh, that adrenaline rush!). Django is an African American slave who has been separated from his wife Broomhilda. One night, his owners, the Speck Brothers, were shot dead by Dr. King Schultz, a bounty hunter, freeing him and the others slaves chained with Django. Now, Dr. Schultz and Django make a deal: Django will help Schultz in finding the Brittle Brothers while Schultz, moved by the feeling of responsibility, will help Django look for his separated wife. As the pair arrived in Mississippi, Schultz discovers that Broomhilda is currently owned by Calvin Candie, the charismatic but sadistic owner of a plantation called Candyland. Now, Schultz and Django plan the scheme to get Broomhilda from Candie: to involve her in an intriguing “ridiculous offer” in exchange for one of Candie’s fighter. 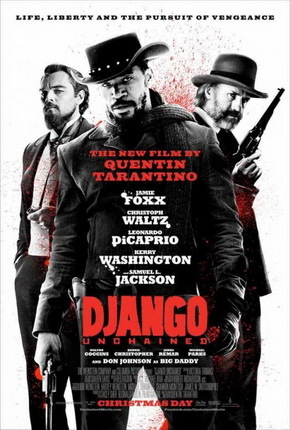 Things does not go quite as planned when Stephen, Candie’s steadfastly loyal house slave, immediately express to Candie his concern that there is a very strong possibility that Django and Broomhilda know each other and the deal to be made with Schultz involving his fighter is just a mere front. This raises suspicion to Candie, and his agitation becomes the trigger to the ensuing scenes of violence involving the deal. It is quite known to everyone that Quentin Tarantino is such a distinctive filmmaker and there is a certain high regard to his work. Equal to that is the pressure put to him in making a string of great films. His last outing, 2009’s Inglourious Basterds, surely did not disappoint. In fact, I think it is the best of that year. This one pales a bit in comparison, but the end product nevertheless is rock-solid entertainment. Tarantino is never afraid of playing around with the material that he has given because he fully knows it, given that he wrote it. His screenplay is again an intelligent one and able of simultaneously reconciling humor and violence at the same time. It is quite obvious that as a director and a screenwriter, he opts for the fearless than the flawless, not that he does not care if his films are flawless or not. But here is someone who has a voice and he is not afraid if it is all right with everyone. 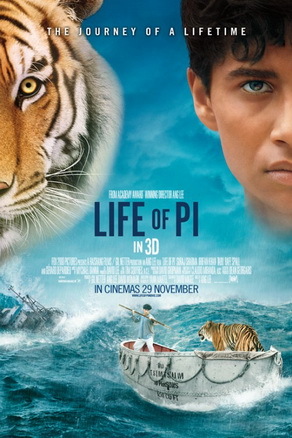 Like what I said, he opts for the fearless than the flawless, and it is quite obvious during the last thirty minutes of the film where it slightly goes off track to actually wrap the narrative with a bang that is either too ridiculous to actually work or simply not as intelligent as the rest of the film. I for one think that there could have been a better ending, but here we are with that ending, and though very well-executed, it is not as well thought of as the rest of the film. It does not achieve the brilliance of the ending of Inglourious Basterds, but the ending itself is quite remarkable, bringing to us a shocking last image that has a staying power. And like the ending, the film has that power to stick with the audience, but I am sure that there could have been more chiseling off of the excesses. The cinematography completely goes for the violence embedded throughout the film. The choice of dominating warm colors adds to the stealthy threat imbued by each scene. It is quite a brilliant work, actually. The editing also fares well, though like my own disappointment in comparison with Tarantino’s last work, there could have been more tightening done. Some scenes, I think, could have been composed in a much more menacing manner, but when we also have some really tense scenes here that quite surpass the tension of other films (the dinner scene before the stand-off is really a heart-throbbing moment), it should be acknowledged accordingly. The music complements to the air of ridicule strongly present in the film. Also, kudos to the production design and costume design that are simply worth mentioning. As with any other Tarantino film, what we have here is a strong ensemble of actors giving life to the rapid-fire intellect of the screenplay. Jamie Foxx does a fine work as the title character. He is fit for the role, and while I do not think that he actually did wonders in this role nor did I think that he is the most interesting thing in the film, the fact that I see that he feels comfortable with his role and that he does justice to the role is enough with me. The other actors actually outshine the lead actor. The other lead actor, Christoph Waltz, is nothing short of amazing as Dr. King Schultz. I had my initial doubts with him before seeing the film, fearing that it would be Hans Landa all over again, but I eventually was proven wrong by that. The only similarity is the razor-sharp delivery of the lines that is totally due to Waltz; he has mastered how to handle difficult bunches of dialogue and deliver it as if they were that easy to say. Leonardo DiCaprio had never been this terrifyingly larger-than-life as Calvin Candie. I have seen almost all of the important performances of his career (he is actually my favourite actor), and to see him reach this high level of intensity as the monstrously merciless antagonist is a real accomplishment that must be seen to be believed. Every line is spoken with a petrifying touch of peril that makes Calvin Candie a truly effective villain. Kelly Washington and Samuel L. Jackson provide invaluable supporting work that can really attest to their acting skills, both giving performances that completes the brutal world of the film by showing the different dimensions of the violence present in the story. As I reach my last paragraph, I must apologize for continuously comparing this film with Tarantino’s other works. I know a film must be judged according to its own merit, but because of the kind of filmmaker that Tarantino is, I am sorry but I cannot help but to compare. I repeat, the film pales a bit in comparison with Inglourious Basterds and it definitely does not belong to its company, but I think this might go with Pulp Fiction as a really strong Tarantino film that one can see. Now that is a good company. America is in Civil War, but President Abraham Lincoln believes that the war will end soon. In accordance to that, he starts the aggressive effort to finally pass the Thirteenth Amendment to the Constitution of the United States, the one which would finally put an end to slavery. What he is doing is not supported by the popular opinion due to differences in interests, principles, and priorities. Conflicts between the Republicans, Democrats, and the Confederate government initially become hindrances to the immediate passing of the amendment, but as President Lincoln remains immovable, his quest to pass the amendment continues amidst his own personal crisis with his unstable wife Mary. After the film was released, many people have hailed this film as Spielberg’s finest motion picture since, I do not know, I guess Saving Private Ryan. And while I do not fully embrace the notion, I understand the logic behind those kind words because it is indeed a very finely crafted film that is unlike any other biopic that I can recall. There is a certain air of authenticity in the whole milieu that can only be pointed to the filmmaking process, and Steven Spielberg, being a very competent director himself, is the one mainly responsible for that. Not a single second of the film do I doubt the legitimacy of the whole setting, and it is due to the strong showing of the directing prowess. He is definitely under control, and it is quite evident in the scenes where he skilfully lets the actors breathe the air in the scenes and move around the space and capturing those moments with an uncontainable love for technique and detail. In those small moments, he proves that he has already mastered the craft of turning reality to cinema and vice versa. As far as we all know that a talky film like this relies on the actors to give life to these characters, it is Tony Kushner’s deft screenplay that provides a sharp backbone to the story. The way each scene is written, there is an obvious amount of focus that suffices in the proceedings, making each subplot cohesive with the others. Obviously, the screenplay gets the spotlight in this film, and it is no way near a bad idea. It is furnished by the display of appropriated knowledge. The jargon is not alienating nor is it too generic for it to sound awkward. The choice of words contributes to the over-all intricacy present in the film. Ace cinematography tops the list of the technical merits of this film, pitting the dark with the light and the area in between to further add the necessary shading to the film to make the whole environment seem tangible. The editing provokes an ambience of unhurried but insightful tactility of the different dimensions of each movement in the story. The music shows emotional restraint that very well suits the tone of the narrative. The production design even impresses more with the amount of care in handling the details in the creation of the environment. It is a really solid work that reflects the utmost dedication to specificity by the filmmaker and the same goes with the costume design. And we are left with the actors who had done exemplary work in their roles. 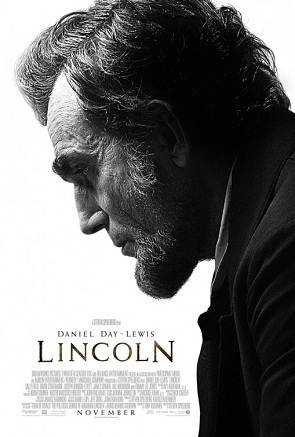 Daniel Day-Lewis is admirable as the title character, giving all in creating this character and surprisingly doing it with full restraint and control. It is quite perceptible that he knows the psyche of the character and acts, moves, talks, and behaves in accordance to that. In the end, what we have here is a virtuoso work from a masterful actor. In the other end of ht spectrum but still in sync with the film’s over-all tone is Sally Field as the disturbed and worried First Lady Mary Todd Lincoln. She only has a few scenes to really flesh out her character, and she takes advantage of that to craft a fascinating and enigmatic character of a woman whose inability to take hold of what is around her is the same as her ability to actually show her love for her husband and her children; making Mary Todd a captivating character. Aside from Field, almost all of the significant characters in the film are men, and they are all played by a group of actors that gave solid work: David Strathairn, Michael Stuhlbarg, Joseph Gordon-Levitt, Lee Pace, and particularly Tommy Lee Jones. Also not to be forgotten is Gloria Reuben as Mary Todd’s personal assistant/maid. Bottom line is that the film is a very strong production from a distinguished filmmaker. We all know that Spielberg could pull this off, it is just the matter of how will he be able to do this. He mostly succeeds. My only hold back stems from the fact that I would have wanted an ample amount of sentimentality enough for me to care more for the characters. I know, many criticize Spielberg for being too much of a sentimental filmmaker (his 2011 film War Horse would be a perfect example), and his decision to tone it down a bit has earned him some really high admiration. But because of the source material, I would have wished for a tiny amount of sentimentality. Still, I cannot discount the over-all impact of the film.